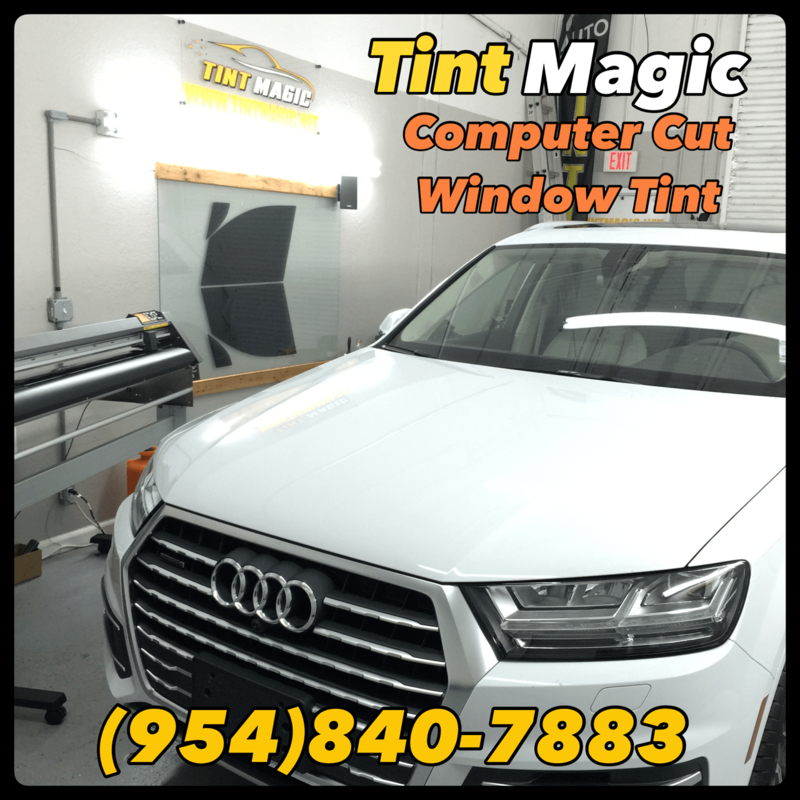 Audi Q7 at Tint magic Window Tinting Parkland, Coral Springs ,Tamarac,Coconut Creek, Sunrise, Weston, Lauderhill, Margate,Deerfield Beach, Pompano Beach. Call us for the best quality and service! (954)840-7883. We are located at 11344 Wiles Road Coral Springs, Fl 33076. In this class, we expect ample room and comfort, but the Q7 adds agility, earning it a 2017 10Best award. The base engine is a 252-hp 2.0-liter turbo four; a 333-hp 3.0-liter supercharged V-6 is optional. Both engines pair with an eight-speed automatic and all-wheel drive; available four-wheel steering and an air suspension help the Q7 remain composed. The high-quality interior features the latest in infotainment, including the optional Virtual Cockpit, a 12.3-inch driver-facing cluster. The Q7 rides on the Volkswagen Group’s latest MLB II architecture and is said to be significantly lighter than before. Contributions to the diet include a high-strength steel structure largely skinned with aluminum panels, copious amounts of aluminum in the revised front and rear multilink suspension, and a standard eight-speed automatic gearbox that integrates the Quattro all-wheel-drive system’s transfer case. Audi claims weight savings in excess of 700 pounds, but our scales told a more modest story—our 3.0T Prestige test car was only 270 pounds lighter.